Beautiful photo, lots of memories. 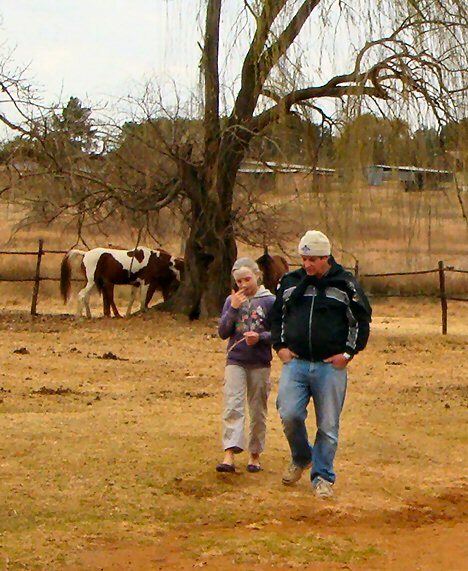 It was taken about a year ago at Harmony Stables around July 2012 – the heart of winter on the highveld. I’m having a chat with my little one while rounding up the horses for an outride. For her tenth birthday we took her and a few of her friends to the farm to play with the horses for the weekend and just rough it up in general. They had a ball of a time. Me, well, I rode “Oupa” on the outride. He is a big but gentle fellow, able to carry my extra kilos without effort. I loved the outride. It gave me time to reflect on so many things that were happening at the time. I heard the hooves on the stones, I smelled the grass, and I wasn’t really watching where we were going. For a long time I let Oupa do what he does best – find his own way. I’ve come a long way since then. If I thought things couldn’t get worse, I was wrong. The last year was brutal and it has seen a major escalation in the noise levels. I needed to rest last year to prepare me for the new onslaught, and Oupa afforded me that opportunity. Now, nearly a year later, Its time to reassess if the road I’ve chosen is the right one. So today I stumble across this incredible blog by an incredible lady, Tanya Geisler, on her blog Tanya Geisler – Your Best Path Forward [click here to view her blog]. If ever there was a case of The Message Will Appear When The Student Is Ready, this was it. I am so looking for answers, begging for direction. I’m searching for somebody to give me strategic direction because I have run out of ideas completely and I don’t know what to do next. My confidence is at the lowest level ever. I want to give up, I no longer know if I am doing the right things. And she answers with the words: “lower your head and trust that you know your best way forward”. Trust your feet. Trust your instinct. Trust yourself. Nobody knows the situation better than you. Trust your own strength. My goodness, I am the one that knows the way, and I’m asking other people to show me! Crazy! I am scared though. I am scared that I am going to cause more damage. I am scared that I will take unnecessary risks. I am scared that I will hurt the very people I want to protect. I am scared that I will hurt the people closest to me, the ones I love the most. I also know that I am not home yet. I have to continue. But for how long still? Over lunch somebody whose opinion I trust a lot asked me a blind question: “When will you stop?” I don’t know. I will have to trust my feet. I will now when I enter the sunshine again. Spiritually, in fact, we probably placed ourselves in this position because we wanted the Universe to teach us the lesson, we wanted to learn to deal with the issues and make it our own. And once the rocky and difficult bits are over, we will enter the gorgeous clearing and step into the sunshine. Just trust your feet and your heart. P.S. I also read some of her other posts, like “I am a Force of Nature. Even when I feel anything but. You are too”. It is all good stuff. Posted on October 16th, 2013 under Books and Reading, Life Lessons, Personal. Tags: Balance, Good Stuff, musing. RSS 2.0 feed. Both comments and pings are currently closed.